The argument rages on, should you sleep with 1 pillow or is sleeping with 2 OK? Regardless of how you many pillows you sleep with you should be comfortable, if you like clambering on top of 3 pillows and wake up refreshed free from neck and back pain then you just carry on! However if you find yourself constantly waking up with a sore neck and possibly even headaches then it’s time to change how you sleep with your pillows. Your pillow is there to keep you comfortable and it does this by keeping your spine aligned and your neck supported. You can even sleep without a proper pillow and use your arm for the same purpose but I love letting my head hit a comfortable pillow at night. How you keep your neck and spine supported depends on what position you sleep in and you find that out by noticing what position you normally fall asleep and wake up in. I normally fall asleep on my side and wake up on the same side, but if I’m really tired I’ll K.O. on my back but I’m still a side sleeper. Side sleepers are the most likely to need 2 pillows because your head is further away from the mattress, but a single plump firmer pillow that keeps your head high is fine too. 2 is usually best if you have broad shoulders. Back sleepers need some good support to keep their necks in line with their spines so a single plump pillow should be fine. If your pillow is too soft your head tilts back and your mouth hangs open which can cause you to snore too. Front sleepers are closest to the mattress and so need the least amount of support, a single thinner pillow should do the trick nicely. What if your a mix of all sleeping positions? If you tend to spend some time in every position then it gets more tricky, but again 1 pillow should do the trick, get a back sleeper pillow and you’ll be just fine. 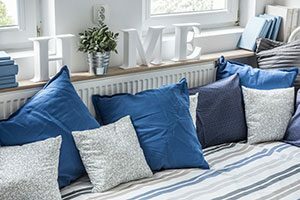 Regardless of how many you have if your pillows are old and flat you’re going to be uncomfortable, pillows tend to last 1-3 years before they need to be replaced so if your pillow is older than that it’s time for an upgrade. It’ll make a huge difference to your sleep so is well worth it. I’ve got a guide to all the best pillows if you need it, just click here.